It’s very well-known that I enjoy individually sized things. In fact, my sister even managed to work that into her toast at our rehearsal dinner. It’s why I like airplane food so much. Everything has its own little compartment, its very own tiny cheese, and of course, adorable tiny silverware. In fact, I’m so smitten with tiny silverware, I’ve begun collecting tiny spoons. And by collecting, I mean occasionally forgetting not to steal them. I would fare well in Lilliput. And so it only seemed natural that after having a leftover pie crust from this tomato tart a while back, I would use it to make tiny pies. 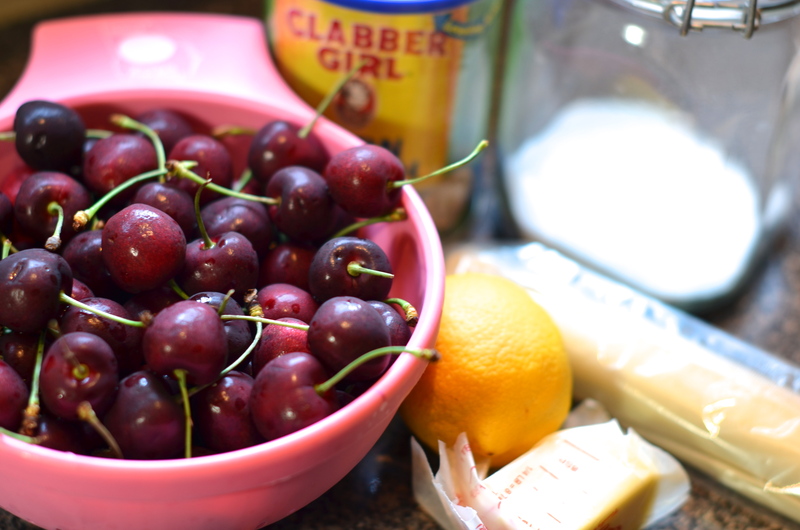 I had some cherries in the fridge sitting near the pie crust – as though they had worked their way toward one another overnight ensuring that I would marry the two in adorability the next day. Done. 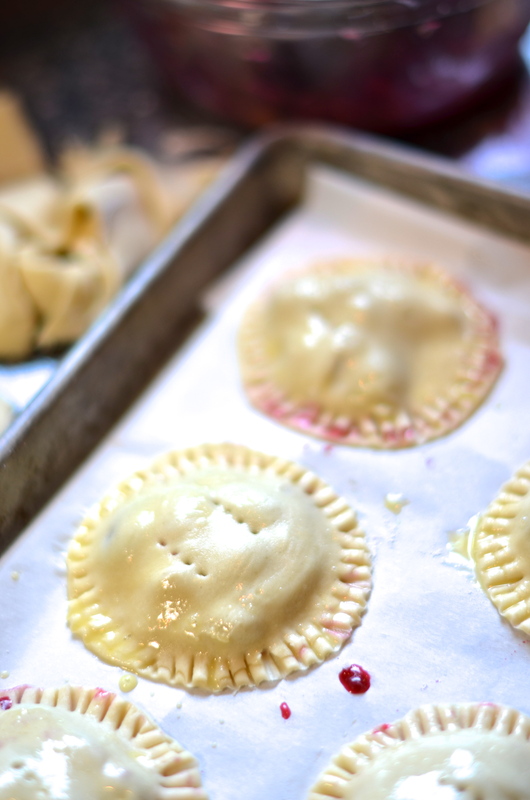 Preheat your oven to 375°F and line a baking sheet with parchment to catch any juicy bits. Change out of any white items of clothing and get ready to pit your cherries. If you’re lucky enough to be able to find your antique cherry pitter use that. If not, grab a small paring knife and settle in. That pitter used to scare me but I wish I had it now. 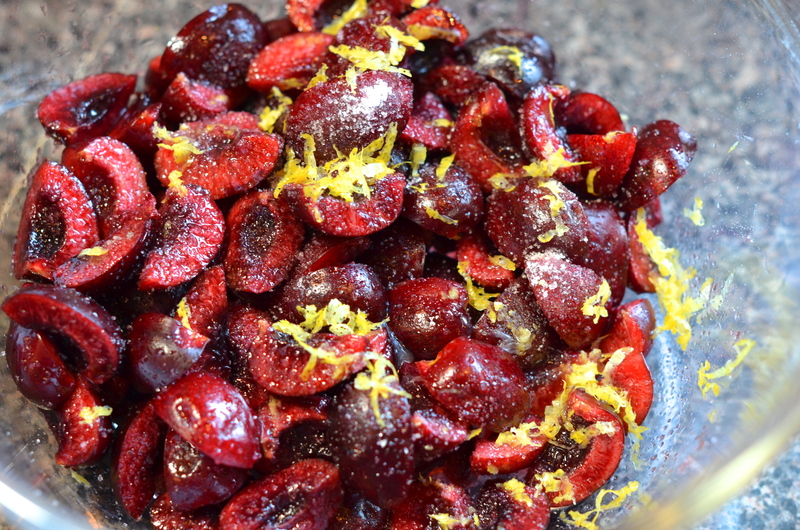 In a small saucepan over medium-low heat, cook all the ingredients (save the flour and crust) for about 10-15 minutes until the cherries begin to soften and the juice begins to thicken from the cornstarch. Throw some flour on your counter and roll out the pie crust. You should thin it out a bit but you don’t need to spend much time rolling it. 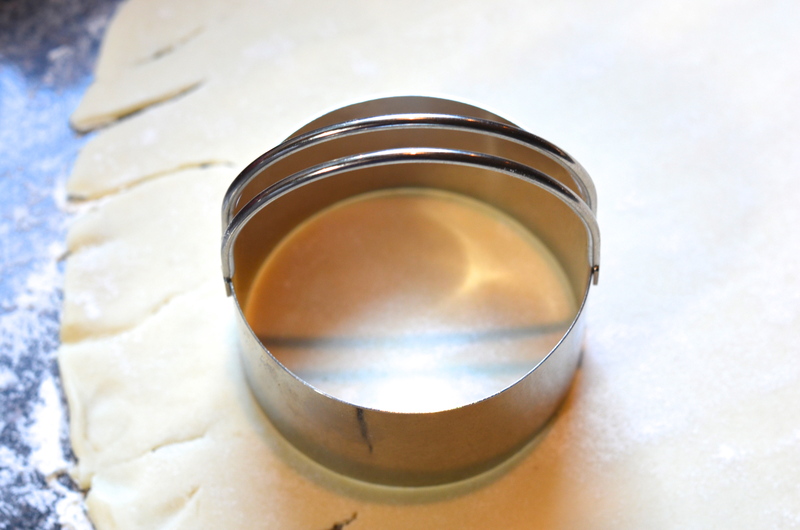 If you have one, grab a large biscuit cutter, if not, grab a whiskey glass out of your cabinet and use that to cut out as many circles as you can make. 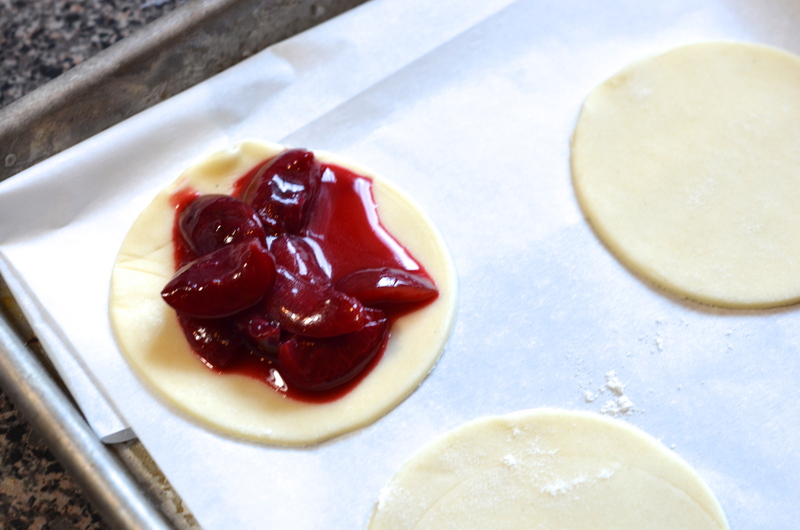 Before you seal everything up, dip your finger in some water and run it around the edge of the pie crust. Stick a top on the tiny pie and pinch together. Then you can “pretty” things up by using a fork to close them even more. I brushed the tops with a beaten egg mixed with a splash of water so they’d be shiny later on. You can do this if you want. You certainly don’t have to. Now just stick them in your oven for 20-25 minutes until they become beautifully golden brown and gooey and make your kitchen smell fantastic. I think these are so adorable. I’m writing in a baby voice right now. 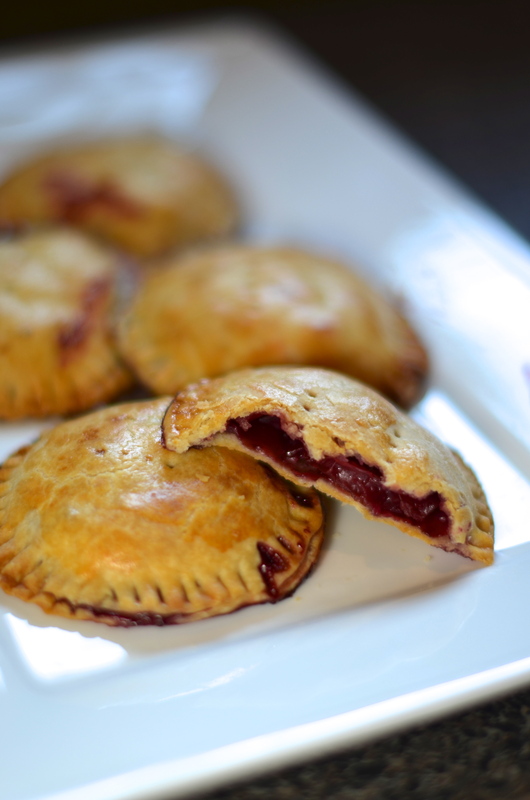 I want to cuddle these tiny pies (and I’m saying pie like Cartman would – “paaah”). These are portable. You can just walk through your kitchen eating them with your hands. You don’t even need to use a tiny spoon – but you could, since you have several. Happy August! I am such a sucker for miniature desserts. Honestly, though, I don’t understand why more desserts aren’t made smaller. You feel less guilty, they’re easier to eat, and way easier to transport. 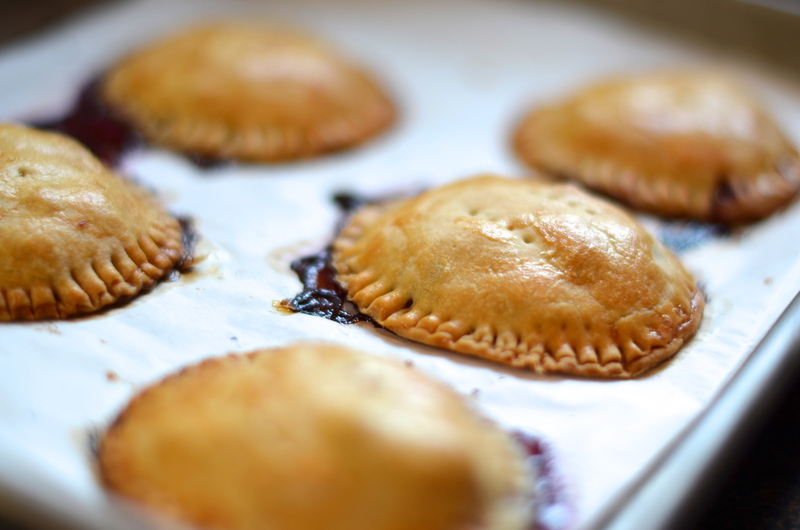 All hail mini pies! All hail is right. Meats on sticks and pies in pockets. God bless America.